With the frequent rains this summer, it’s been wet. 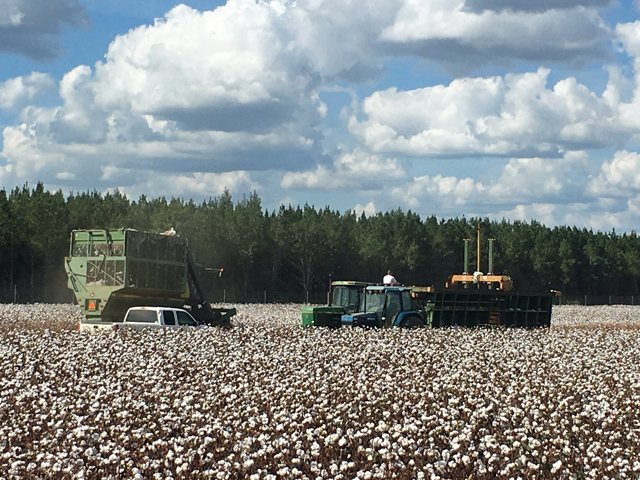 You may not have been able to get into fields for timely topdress fertilizer applications on your cotton. If you’re still within 60 days of planting, nutrient demand has been low, so you still have an opportunity to apply granular fertilizer, particularly nitrogen (N) and potassium (K). However, some of our early-planted cotton has reached the third week of bloom, and nutrient demand are much higher during this time. Questions have come in about the possibility of foliar fertilization to address this issue. Can I apply foliar fertilizer by pivot? Not effectively, no. The amount of water applied by pivot essentially washes the fertilizer off the leaves, making this essentially a soil-applied fertilizer. And if the soil is saturated, cotton will need to recover somewhat before it can effectively take up foliar applications. What can I do to determine if my crop is nutrient stressed? Petiole testing and leaf tissue testing are good ways to track the nutrient status of cotton. However, petiole and tissue testing should be done at intervals throughout the season, so that you can track how the crop is doing. A “one-and-done” tissue test won’t help you track nutrient levels over time, and may provide a snapshot of the field, but without referencing previous tests, these can be of limited value since wide variation in nutrient levels exist among cultivars. In addition, remember that K can be taken up as “luxury consumption,” which can confuse interpretation of tissue K results. That said, during early bloom, I like to see 3.5-4.5% N (35,000-45,000 ppm NO3-N), 1.5-3.0% K (15,000-30,000 ppm), and 20-60 ppm boron (B) in leaf blades from vegetative branches collected representatively from the field. (Vegetative branches are identified as those at nodes before fruiting branches, where the first position of the branch is not reproductive, Fig. 1). If you’re below these values at this time of year, a supplemental foliar application may be appropriate. 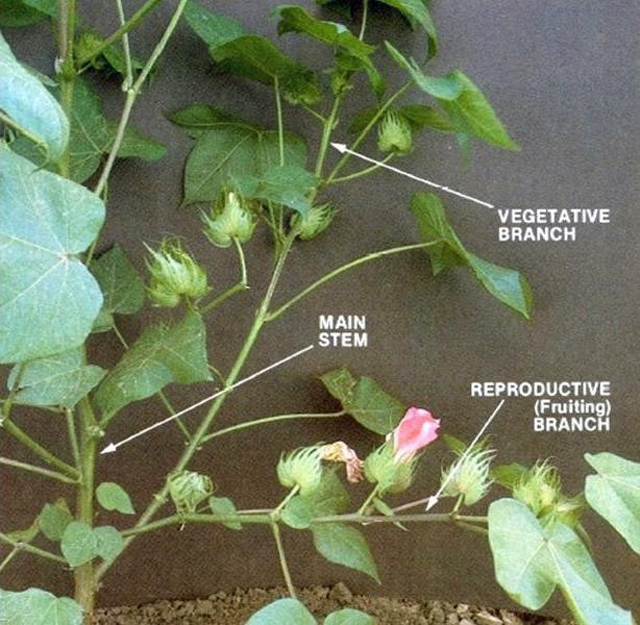 After blooming, petiole tests are a better indicator of nutrient status in cotton because leaf blade nutrients are shunted to reproductive tissue, and leaves are often damaged by disease. Figure 1. Vegetative branches are those branches prior to reproductive branches, where the first node on the branch is not a square. Leaves from these branches can be useful for tissue testing prior to boll set, although periodic petiole testing throughout the season is better for tracking nutrient status in cotton. Leaves from vegetative branches are better than those from reproductive branches because there are fewer flowers/reproductive parts that serve as nutrient sinks from leaves. Image from www.soilcropandmore.info/crops/cottoninformation/pgd/hacpg.htm. Can I get enough nutrients on cotton using foliar fertilizer during peak demand? Foliar fertilization should be considered supplemental fertilization as part of a sound fertility management program. If you applied 1/4 to 1/3 of N and K at planting, along with all of the required P, this is likely enough to hold you over until you can get back into the field. In this case, you may be able to foliar feed until you can get in with ground spreaders. However, if you didn’t apply any N or K at planting, you are not likely to meet demand during peak production using foliar applications. (Remember, peak K demand in cotton is up to 3 lbs K/ac per day.) This is partly why we recommend applying 1/4to 1/3 of N and K at planting – as a mitigation strategy for late applications due to weather. I am often asked if split applications result in increased yield. The answer is no, not always. The reason we recommend split applications is in large part for cases such as this, where you can’t get in the field on time for topdressing. But if you’ve applied part of your fertility early, you should have enough nutrients to hold you over until you can apply topdress applications. If you need both N and K, potassium nitrate (KNO3) can be applied alone or in combination with urea. (The use of KCl is not recommended because of the high salt index.) The main problem here is application volume and rates. High rates can burn leaves, particularly with urea, and low volumes will not likely apply enough nutrients to make a difference. What about micronutrient foliar fertilization? Foliar feeding micronutrients is effective, but deficiencies should be addressed prior to bloom. Indeed, liquid applications (including by pivot) of micros are more effective than granular applications because of the small amounts applied. Suppose you were to spread granular B at 1 lb/ac, prills would end up tens of feet apart, which doesn’t do the plants in between any good. Liquid applications of micro-nutrients ensure that they are uniformly distributed in the field. Identification of micronutrient deficiencies is best accomplished with a tissue test (again, prior to bloom). Probably not. Research has shown increased uptake with adjuvants, particularly with K applications, but this does not commonly increase yield. If it makes you sleep better, feel free to use an adjuvant though. It probably won’t hurt anything except your wallet, and even then the damage won’t be too great. Just don’t expect a yield boost. Take a stand. Just make a recommendation, will you? If you have a sound fertility management program, additional foliar fertilizer applications are unlikely to help. If you need a rescue treatment for micros, foliar fertilization is a good idea. If you need a rescue treatment for macros (N-P-K), I remain skeptical that foliar applications will help. If you’re managing 3 bale/ac cotton, more attention to fertility and disease will be critical. If you’re managing 1 bale/ac cotton, the extra expense of foliar fertilization won’t be worth it. Response to foliar K is unlikely, if soil test K is adequate or greater than 125 ppm K.
Managing 3 bale/ac cotton requires more attention to detail than managing 1 bale cotton.